Brunch is the most important meal of the day. Who wants to get up early? We have taken the flavors of brunch and put them in a ball. You will make this. Trust us. Tune in to the Your Dog’s Diner Facebook page Sunday at 11 a.m. to watch us make this! 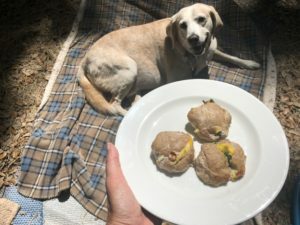 PrevSunday Supper Series Episode 1NextBarkmosas For Dogs! A Brunch Necessity!